When you begin taking advantage of conditional logic, or install a premium or custom template, one PDF per form just isn’t enough. That’s why we’ve built an AJAXified PDF list to help you activate / deactivate, duplicate and delete your PDFs – all without a page reload. You can also add new PDFs or edit existing ones (it’s not AJAX-powered though). The user interface is similar to the confirmation and notification lists so you should feel right at home. To access the Managing PDFs page see Locating Your PDF Settings. This column displays the internal PDF name. It also functions as the “actions” column. By hovering over the row the Edit, Duplicate and Delete actions will appear in this column. This column displays a sample shortcode that generates a download link for the PDF. Use it in the Gravity Form confirmations or notifications. 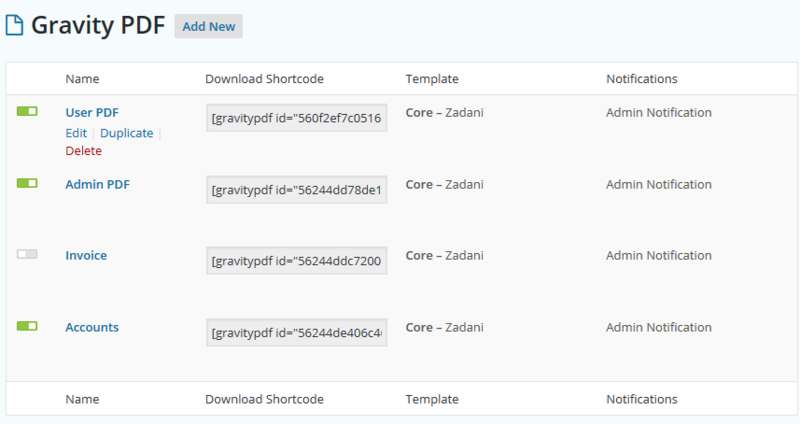 See our shortcode documentation for more details about the [gravitypdf] shortcode. The selected PDF template will be displayed in this column. Along with the name, the template’s group will also be displayed. For instance, any template that ships with the software is apart of the Core group. This is useful when you start creating custom PDF templates. PDF templates may also require a specific version of Gravity PDF. If the version requirements aren’t met a notice will be displayed in this column. If you’ve configured the PDF to attach to any of the form’s notifications a list of those notifications will show in this column. The Edit, Duplicate and Delete actions will appear in the Name column while hovering over the row. New PDFs can be added by clicking the Add New button, which is located to the right of the Gravity PDF page heading. See our Setup PDF documentation for more details on adding new PDFs. Click a PDFs Edit action to modify an existing PDF configuration. See our Setup PDF documentation for more in-depth details on what each PDF setting does. PDFs can be completely disabled by using the activate/deactivate toggle – located to the left of the Name column. Once a PDF has been deactivated users and administrators will no longer be able to access the document. The PDF will not be attached to email notifications, and its shortcode won’t generate a link. You can duplicate an existing PDF configuration by clicking the Duplicate action. This action will happen in the background without the page reloading and once done you’ll see a copy of the PDF added to the list. You can delete an existing PDF configuration by clicking the Delete action. A warning box will pop up asking you to confirm before a PDF is deleted. This action will happen in the background without the page reloading.